“What are you doing to make a difference in this world? What are you doing to live out Dr. King’s dreams?” Chinyere Okogeri ’18, the student keynote speaker for Martin Luther King Jr. Week, asked audience members to think about their roles in creating an inclusive society. 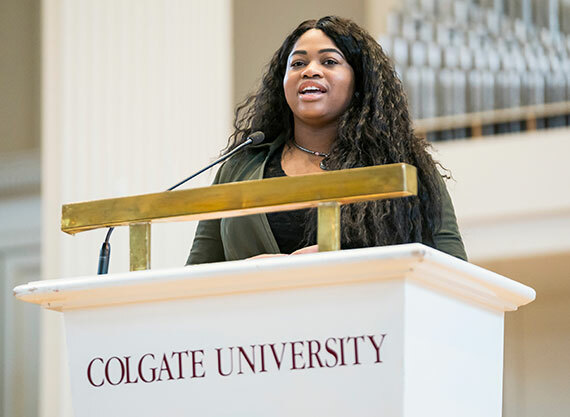 Okogeri’s speech was part of the opening ceremony kicking off Colgate’s weeklong celebration of the civil rights leader. The theme of this year’s MLK Week was “Beyond a Dream: Living the Legacy of Dr. Martin Luther King Jr.” Facilitated by the ALANA Cultural Center, the week featured workshops and conversations aimed at giving students, faculty, and community members opportunities to engage with one another around issues of social justice, advocacy, and fellowship. Loretta Ross, cofounder of the SisterSong Women of Color Reproductive Justice Collective, delivered the Thursday night keynote. A packed audience listened to Ross discuss “Reproductive Justice as Human Rights." Volunteering at the Madison Historical Society during the day of service. Sorting supplies at the Hamilton Center for the Arts. Students help out at Hamilton Center for the Arts during the day of service. Though Okogeri acknowledged the work that has already been done toward King’s envisioned promise land, she highlighted the work that is just beginning. Loretta Ross, cofounder of the SisterSong Women of Color Reproductive Justice Collective, echoed this sentiment during her keynote address, “Reproductive Justice as Human Rights,” later in the week. Ross is an advocate for intersectional social justice and a human rights movement that includes everyone. Suzanne Spring, director of the Office of Undergraduate Studies, facilitated a workshop called “White People and the Appropriation of Dr. Martin Luther King Jr.,” which focused on the appropriation and decontextualization of King’s words and work. Reagan Mitchell, assistant professor of educational studies, facilitated “Please, Can I Get Some More King!,” a presentation about the radical vision of King and how his work is interpreted today. The week concluded with a day of service, during which students, faculty, and staff served eight community organizations in Hamilton and the greater central New York area. Approximately 50 volunteers participated, combining to 150 total service hours, at locations including a local nursery school, the Earlville Opera House, and a second-hand clothing shop.